Arm all teachers? The idea sounds insane when your kid’s elementary school teacher can’t back out of her driveway without knocking over the garbage cans. No one is seriously suggesting that. What is being suggested is that we stop making it illegal for those teachers (and parents) to carry concealed at schools. We allow teachers to shoot back rather than die helplessly. Nevada’s school gun ban was created because of armed students, generally gang members, not teachers. Teachers, staff, parents, and college students were never a problem. In fact, in 1989, school shootings were an unheard of as a phenomenon. Self-defense carry was at an all-time low among Americans. We don’t live in those times any more. What we need to do is ultimately repeal the prohibition for adult college students, parents, teachers, and staff to carry handguns on campus. If schools and districts wish, they can require additional training beyond the concealed firearm permit course, such as regular qualification, for teachers and staff who will carry regularly. That way, only proficient shooters who are able and willing to engage the shooter without unnecessarily threatening students. Barricade themselves in the classroom, then kill the shooter as he tries to come in the door. “Pop out” of a classroom or hiding place and ambush the shooter as he comes around the corner or into the room. Return fire if confronted by the shooter while evacuating. Coach Aaron Feis, who was also a concealed carrier (off-campus of course), shielded two students with his body. He should have been allowed to carry and shoot back. We’ve heard the stories of brave, unarmed people saving lives by sacrificing theirs too many times. Allowing schools to remain gun-free zones is tantamount to sanctioning these murders. If there were an epidemic of school fires, would anyone seriously consider opposing fire safety reforms? Teachers, if you have a good relationship with your principal and you know they may be receptive to such a thing, have a discussion about getting written permission from your principal to carry a concealed handgun on campus. You must have a permit, of course, but this will allow you to legally do so. The risk is that virtually no district will allow this and will immediately discipline, likely terminate, both of you. However, getting fired is better than death. What the permission slip will do is prevent prosecution if you are found out or have to use the gun. One Nevada principal allergy gave permission to a staff member to carry on campus. The principal denied it, of course, calling the “note” a forgery. The news story seems to have gone down the memory hole, but a few of you can probably recall reading about it. No doubt—as several people have told me—principals across the state are already giving secret permission. God bless them and keep it up. On a larger scale, continue to talk to your administrators and trustees about changing school policy to allow teachers, staff, and parents to be armed on campus. Policies can be simple enough to allow permittees to leave the gun in their locked vehicle; at least it’s something and would keep concealed carry parents from being prosecuted for driving through the parking lot. Parents, I encourage you to talk to and write your principals and trustees. If you have a good relationship with principals, ask for permission to carry, even if only in your car in the parking lot. Help them understand the issue and help change their minds. 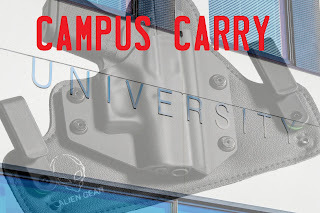 Vote for campus carry friendly candidates. College students, you can apply for campus carry now. Though permission is rarely granted, by applying you are at least helping to show that there is demand for it. When everyone is told “don’t bother, they never grant permission,” it becomes a self-fulfilling prophecy. We’ve created a helpful application packet to make the process easier (see the blog post as well). Be sure to talk to your campus presidents, administrators, and trustees. Don’t forget your fellow students—take a classmate shooting. We have to do something to save lives and those things are not the same, tired gun control talking points that are about disarmament. It’s time to channel our energy into pressuring political changes and helping educating teachers, administrators, and the public on the reality about concealed carriers.